Do you have dry and rough hair? Are those tiresome hair care routines not working on your tresses? Well, there’s definitely something wrong! To reap the maximum benefits of your shampoos, conditioners, and other styling products, you first need to know your hair’s porosity level. This will not only help you buy products according to your hair type but also improve the overall health of your hair. So, get ready to do some crazy fun experiments to find your hair’s porosity level. But, before we get into that, let’s understand what hair porosity is. Hair porosity refers to your hair’s ability to absorb and retain moisture, color, or any other type of liquid in its cuticle layer. Knowing your hair’s porosity helps you choose the right hair care products and treatments that are suitable for your tresses, thereby saving you the trouble of creating your own hair care regimen. Some people have very porous hair, some have a normal level of hair porosity, while others may have very low porosity. There are different levels of hair porosity – low, medium/normal, and high – that have been discussed in detail in the next section. In low porosity hair, the cuticles are tightly closed and clamped down, resisting the entry of moisture into the hair. This type of hair makes it difficult for moisture to enter it, but it also retains existing moisture for a long time. This type of hair does not absorb oils and other hair treatments easily, causing a lot of product to build up on the scalp. Normal porosity hair absorbs and retains the right amount of moisture. This, in turn, makes your hair healthy, lustrous, and voluminous. It also allows you to experiment with different kinds of hairstyles and coloring processes. Highly porous hair has raised cuticles that absorb and release excess moisture, making your hair frizzy and lackluster. This type of hair also gets tangled easily. Now that you know there are different levels of hair porosity, I’m sure you are curious to find out how porous your hair is. Do one of the hair porosity tests listed below to find out! Take a few strands of your hair and put them in a bowl of water at room temperature. Make sure that your hair strands are clean as any residue on them will affect the results. Observe the hair strands for about 2-4 minutes. If your hair sinks immediately to the bottom, it means your hair has high porosity. If it sinks very slowly, it means you have normal hair porosity. If your hair is floating on the surface or in the middle of the water even after the stipulated time, it means your hair has low porosity. Slide a hair strand between your index finger and thumb, starting from the tip towards your scalp. If you feel that the slide is bumpy, you have high hair porosity, and if the slide is smooth, you have low hair porosity. If the slide is normal, your hair porosity is normal. Pick a strand of your hair and spray some water on it. If the water droplets sit on the surface of the strand, forming beads, you have low hair porosity. If the water gets absorbed quickly, you have high hair porosity. But, if the water sits for some time on the surface of your hair and then gets absorbed, you have normal hair porosity. Apart from these popular tests, there are some secondary hair porosity tests that you can take to get proper confirmation of the results. Check them out below! Go to any place that has a strong odor/smell (a perfume kiosk in a mall or a fast food joint) and stay there for a considerable amount of time. If your hair smells of that place when you get back home, you have high hair porosity, and if not, you have low hair porosity. However, if your hair smells faintly of that place, you have normal hair porosity. Take note of the pace at which your hair products get absorbed into your hair. If the products get absorbed at a very fast pace, you have high hair porosity. If they sit on the surface of your hair for a long time, you have low hair porosity. If the products are working somewhere in between, you have normal hair porosity. 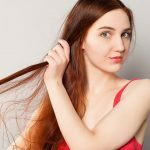 In this test, you have to also factor in your hair type (curly, wavy, or straight hair) because curly hair takes time to absorb hair products while straight hair absorbs them quickly. Dampen your hair and see how long it takes to dry. Hair with high porosity dries quickly while low porosity hair takes a long time to dry. If your hair dries at a normal pace, you have normal hair porosity. Hair with low porosity is usually lustrous and reflects light while hair that is highly porous is usually dull. If your hair is moderately shiny, you have normal hair porosity. If your hair gets tangled easily and you find it difficult to remove the tangles, you have high hair porosity. If your hair is easy to manage, you have low hair porosity. If your hair is somewhere in between, you have normal hair porosity. Hair with high porosity is the most receptive to protein treatments and shows quick results. If your hair is not receptive to protein treatments, you have low hair porosity. Normal porosity hair responds to such treatments in a balanced manner. Once you have determined your hair’s porosity level, the next step is to figure out how to take care of it. Let us see how to take care of low, normal, and high porosity hair types. Use moisturizing products like argan oil, coconut oil, and jojoba oil. For best results, heat the oil for a few seconds before massaging it onto your hair and scalp. Pamper your hair every two weeks with conditioning hair masks that contain avocado, banana, and olive oil. Use a clarifying shampoo once a week to remove all the product build-up on your hair and scalp. Medium porosity hair receives the right amount of moisture. It responds well to styling, coloring, and other chemical treatments. However, don’t indulge in these chemical treatments too often as they may damage your hair and cause hair fall. Use a leave-in conditioner every alternate day to retain the moisture and prevent your hair from drying out. Massage your hair and scalp with jojoba oil, olive oil, avocado oil, or coconut oil regularly to nourish and moisturize them. Avoid using heat styling tools, serums, and hairsprays. It is essential that you know how porous your hair is to devise a great hair care regimen for it. It the best way to tackle hair issues – like hair fall, breakage, and dullness – at the core. Do have any more questions about hair porosity? Leave them in the comments section below, and we’ll get back to you!